Almost every smart phone on the market can easily upload media to social networks and photo sharing sites. However, the cameras on these devices are often mediocre at best. As a result, most people still prefer dedicated point-and-shoot or DSLR cameras for quality photography. Unfortunately, these lack networking capabilities, making it difficult to share captured photos while on the go. Eye-Fi solves this issue by letting users upload images from their camera through their phone’s 3G connection. For those not familiar, Eye-Fi makes Wi-Fi enabled SD memory cards for regular cameras to wirelessly transfer images to their computers and social media sites. While we liked the concept of transferring images without cables, we found quite a few issues when reviewing the older ﻿Eye-Fi Explore Video last year. Setting up a Wi-Fi network required a computer and the card was nothing more than a storage device when no wireless access points were available. Furthermore their mobile application did no more than view the progress of uploads. Eye-Fi fixes these issues with a new mobile and tablet application. 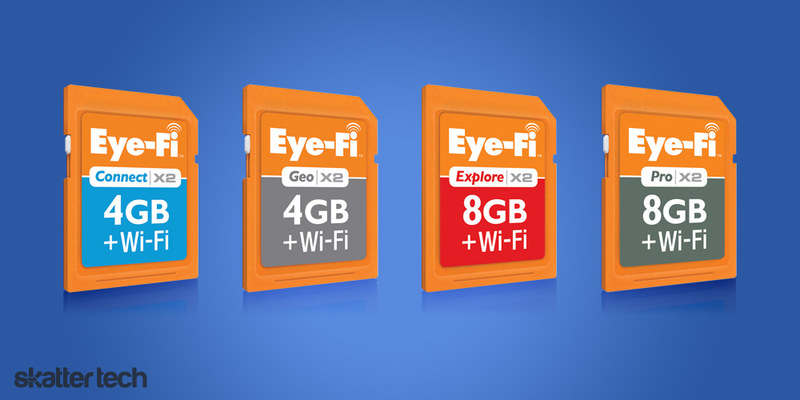 The Eye-Fi direct mode feature converts the SD card into a wireless hotspot which enables smart phones to connect to the card and download any media files. Users can easily share images and videos with friends and family online even without a Wi-Fi connection nearby. The feature also makes it easy to view images on a large tablet or smart phone display, instead of having to squint at a small camera screen. Users can also backup media from the card to save space and eliminate the need to carry around multiple memory cards. Eye-Fi offers four models ranging from $50 to $150, but with a little shopping around we found them on sites like Amazon for as little as $45. Representatives told us that the direct mode feature will be available as a free update for all current models later this year.